To read Wrack Lariat by Heller Levinson is not only to read a book of poetry, but also to engage in a linguistic exploration of the world through the lens of Hinge Theory. 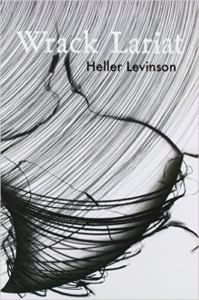 Of Levinson’s eight books of poetry, this is his third written according to Hinge Theory. Hinge Theory is complex, but at its center, it is a linguistic concept to free language from traditional structures and expand words in new and exciting ways, and Levinson presents it as the next stage beyond Wittgenstein, Chomsky, or Derrida. This provides an idea of a basic Hinge poem, but the form expands and different modules explore words in different ways. Are we still talking about poetry? Well, sometimes Annis calls them “Hinge applications” rather than poems. The latter half of the book shifts focus to visual art, starting with the eponymous section “Wrack Lariat.” The term appears to be Levinson’s version of Nietzsche’s Übermensch, encapsulating the struggle of the best artists. Levinson’s quest for Van Gogh spans several poems across fifty-five pages. While the speaker here is autobiographical, I wonder if Van Gogh himself is evoked in a few poems. At the beginning, Van Gogh keeps showing up, but the speaker rejects him, “I placed a huge X through his skull, get out’a here, I’ve got no use for you.” Nevertheless, the speaker ends up flying to the Netherlands in search of Van Gogh. At times, we see Van Gogh imagined into the modern world: “Would his tubes of oil paint clear security?” The poet engages in a loud cell phone conversation with Van Gogh during a bus ride, “Boy, you really threw them for a loop with that crow picture.” Ultimately, the poet is able to engage with Van Gogh’s work, exploring themes of being, love, and the quest for home. The section is presented like a narrative, with whole pages being written in prose, yet we see the poetry seamlessly weaved in, expanding the section beyond a simple narrative. At times, the poems are decidedly anti-technology: “walking the NYC streets, — people looking Down, immersed in their ‘screens,’ De-Evolving from becoming Erect.” Even so, there are certain technological/information age aspects at play in the background of the poetry. The section titled “Accidentals” includes the explanation, “They are restlessnesses wishing to stir from ‘My Documents.’” A poem called “beveling the séance daughters” includes the footnote, “All quoted matter taken from the Scottrade ads on Yahoo News.” Despite the poet’s feelings on technology, there is a clear connection between the endless web of hypertext and the expanding connections of Hinge poetry. Joseph Patrick Pascale’s fiction has been published in Birkensnake, Literary Orphans, and 365 Tomorrows, among other journals and anthologies. His website is josephpatrickpascale.com.